The VDC Display Systems (VDCDS) integrated Multipurpose Supporting Arms Trainer (MSAT) Display System provide a full color, real image wide-angle display comprised of a continuous dome screen segment [260 degree (°) Horizontal Field of Vision (HFOV) x 60° Vertical Field of Vision (VFOV), projectors, alignment system, handset projector control, and projector mounting structure, mounting equipment and cabling. 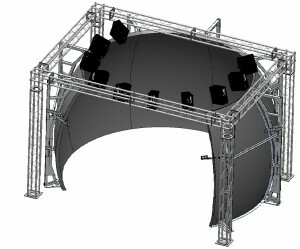 Multipurpose Supporting Arms Trainer (MSAT) Display System consists of three (3) Commercial Off-the-Shelf (COTS) state-of-the-art SONY SRX S105 Liquid-Crystal-on-Silicon (LCoS) projectors which are scalable for advanced warping and edge blending using a camera-based image feedback system. The projectors, in a light tight box, are placed on a mounting framework above the spherical dome screen. Each Multipurpose Supporting Arms Trainer (MSAT) Display System provides correct perspective, color, resolution and luminescence requirements for displaying customer-provided day, dusk, night and simulated Night Vision Device (NVD) [i.e., Night Vision Goggles (NVGs)] visual scenes on Image Generators (IGs). VDCDS also provides a system control Graphical User Interface (GUI), auto-color system and filter system to facilitate NVG training on the MSAT Systems. VDCDS also provides an MSAT version with Light Emitting Diode (LED) Solid State Light (SSL) 6200U projectors [with Infrared (IR), warping, blending and auto-color] and 260° HFOV x 60° VFOV dome. 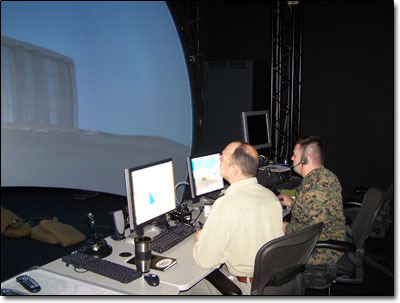 The VDCDS integrated Multipurpose Supporting Arms Trainer (MSAT) Display System, Versions 2 through 3, provided a full color, real image wide-angle display comprised of a continuous dome screen segment, Projectors, Alignment System, handset Projector control, and Projector mounting structure, mounting equipment and cabling. Each Multipurpose Supporting Arms Trainer (MSAT) Display System consisted of 3 Commercial Off-the-Shelf (COTS) state-of-the-art SONY SRX S105 Liquid-Crystal-on-Silicon (LCoS) Projectors and scalable for advanced warping and edge blending using a camera-based image feedback system. The Projectors, in a light tight box, were placed on a mounting framework above a spherical dome screen. Each Multipurpose Supporting Arms Trainer (MSAT) Display System provided correct perspective, color, resolution and luminescence requirements for displaying the Government-provided day, dusk, night and simulated Night Vision Device (NVD) [i.e., Night Vision Goggles (NVGs)] visual scenes on the TJ, Inc. -supplied MSAT Image Generators (IGs). VDCDS also designed, developed and provided a system control Graphical User Interface (GUI), auto-color system and filter system to facilitate NVG training. VDCDS also provided anMultipurpose Supporting Arms Trainer (MSAT)1 Refresh, replacing Cathode Ray Tube (CRT) Projectors with VDCDS Light Emitting Diode (LED) Solid State Light (SSL) 6200U Projectors [with Infrared (IR), warping, blending and auto-color). We also replaced the existing dome with a 260 degree Horizontal Field of Vision (HFOV) x 60 degree Vertical Field of Vision (VFOV) dome.